Latchkey Kids Registration Information and Demonstration. The Latchkey Kids calling program is designed and developed by Database Systems Corp. (DSC). This program is an integral part of the CARE (Call Reassurance) phone system that checks on the well being of home alone children as well as senior citizens who need regular contact. Latchkey kids typically are left home alone after school before their parents return from work. DSC provides CARE systems to many communities throughout the U.S. and Canada. DSC also provides an individual service for parents who wish to enroll their children. To assist parents when enrolling their children in this calling service, DSC provides an online registration process. Here are the simple steps that should be followed when enrolling a child in the Latchkey Kids calling program. Register Today! using our convenient web registration process. Use your email address as a valid login name and choose your own unique password. This is very important to ensure the privacy of your information and to prevent unauthorized access to your account. 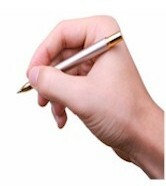 To use our Latchkey Kids calling service, you must first agree to a Terms Of Service Agreement. Upon accepting these, an account maintenance screen will appear that lets you proceed with the registration and activation of your account. On each screen, you may notice a blue question mark to the left of each title and description. Simply move your mouse over this question mark and CARE will provide a brief description of the item. NOTE Items highlighted in red are mandatory and must be complete before CARE can begin making calls. 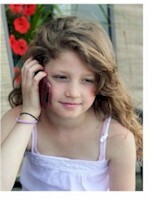 This feature identifies your child's phone number (usually your home phone). For security purposes, this same phone must be used to call the CARE system to register it with your account. From the registration screen, select the "Set Phone Number" option. 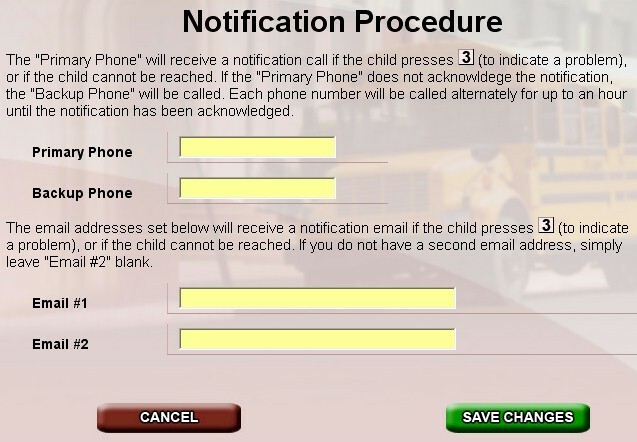 This brings up another page that provides instructions on how to designate the phone that is to be called by the CARE Latchkey Kids program. 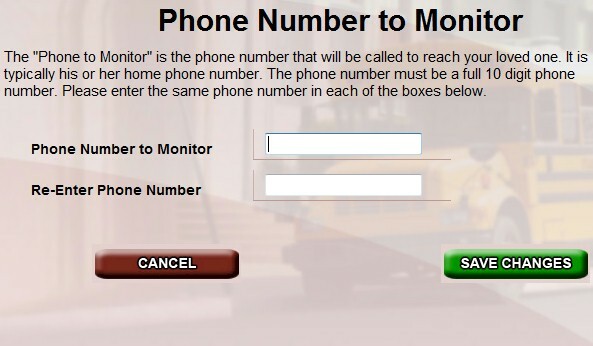 The 'Phone Number to Monitor' is the phone number you would like us to call to check on your child. It is most likely your home phone number. To set or change this number, you will need to call into the toll-free number provided on the 'Phone Number to Monitor' page and enter a 6 digit code that is unique to each registrant. This requires that your Caller-ID be turned on so that CARE can recognize the phone number. If it is unavailable, CARE will notify you and ask you to unblock the Caller-ID. 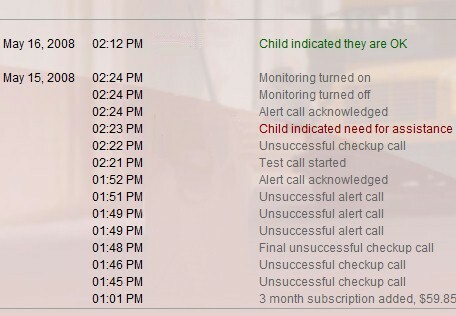 This feature lets you specify a primary and secondary contact in the event CARE system needs to notify someone when the child needs assistance or does not respond. From the registration screen, select the "Set New Contacts" option. This brings up another page that lets you add or change the contact information. Contacts are the parents, guardians or responsible individuals that need to be notified if a child needs assistance or does not answer the phone. Up to 2 phone numbers and 2 emails may be entered. Each account can be customized to allow you the ability to have your child called at various times based upon the day of the week. Calling times can even be randomized during up to a 2 hour window. From the registration screen, select the "Set Call Times" option. This brings up another page that lets you change the days of the week and time per day when CARE will call your child. 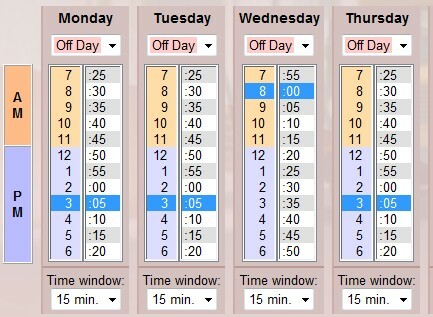 First, select "Call" or "Off Day" for each day of the week. Next, click the 'hour' and 'minute' for each calling day. The selected times will be highlighted in blue. The "Time Window" allows you to randomize the call per day. CARE will call the child anytime within the specified start time for however many minutes designated by this parameter. Click the "Save Changes" button when you've finished setting the schedule. 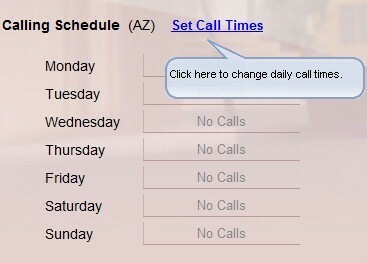 Review the 'Calling Schedule' section of the main control page to confirm the schedule is set as you wanted. Finally, this feature lets you activate your account. 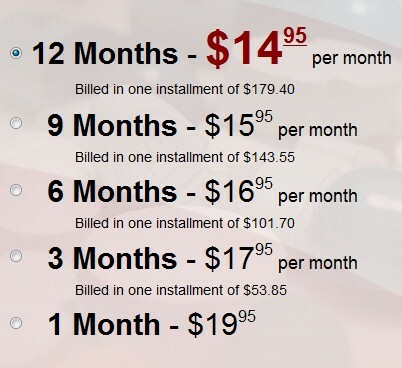 This is done by selecting a payment option and method. From the registration screen, select the "Click Here to Activate the Account" option. This brings up another page that lets you use a credit card to fund your account activate it. 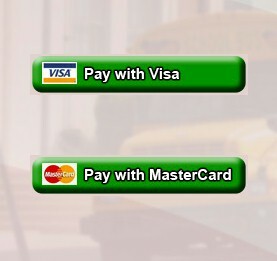 After choosing one of 5 payment options, select the "Continue" button. Choose a credit card for payment. DSC currently supports either Mastercard of Visa. 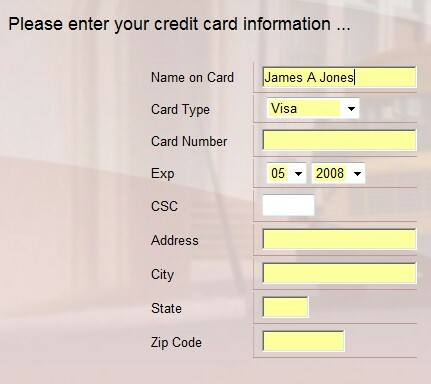 After this selection, the following credit card information screen will appear. Enter your credit card data including the proper billing information as well as the credit card. Once complete, enter the "Continue" button and if the information is accepted, your account will be activated. 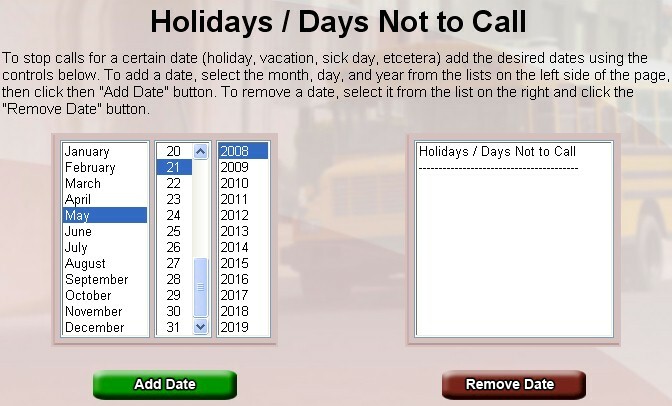 This feature lets you choose specific dates when the CARE program should NOT call your child. This is typically holidays or vacation days. From the registration screen, select the "Set New Dates" option. This brings up another page that lets you add or remove dates from this exclusion. This feature lets you view all activity relating to your account including each call made to your child and the disposition of each call. 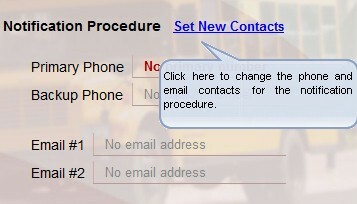 Changes in phone numbers, contacts and calling schedules also appear in this display. From the registration screen, select the "View Recent Calls" option. This brings up another page that lets you view your account activity. This feature lets you suspend and re-activate an account using a simple toggle. By default, once an account is activated, it is in an active state. If the parent wishes to suspend calling for a period of time, the account status can be turned off. From the registration screen, select the "Active" or "Turned Off" status button to toggle between these two states. 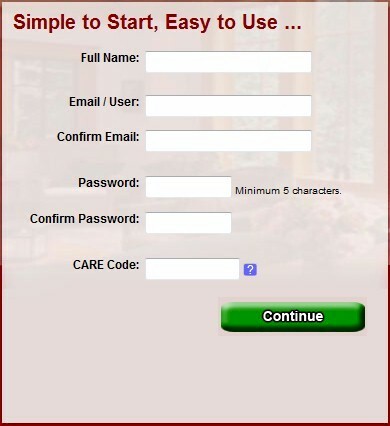 You can test the CARE Latchkey call to ensure that all of the phones and parameters are working properly. From the registration screen, select the "Test Call" option. This brings up another page that lets you test the CARE call. Register Online using our convenient web registration process or Contact DSC to learn more about our CARE latchkey children calling services.